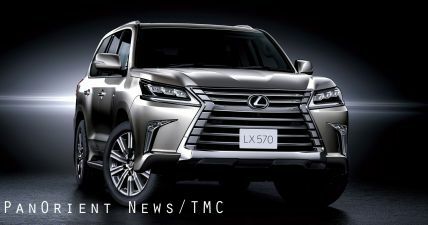 Tokyo - (PanOrient News) Lexus announced today it will start sales of the refreshed LX 570―positioned as the flagship model in its SUV line-up―at Lexus dealers across Japan from September 14. The LX was first launched in 1996 in North America as the Lexus brand's first SUV. 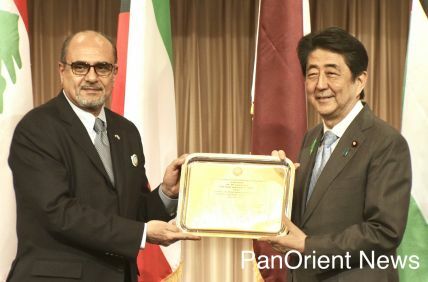 Since then, sales have grown there, while also expanding primarily to the Middle East and Russia. The new LX boasts dramatic advances in both design and driving performance, and will be sold in Japan with three rows of seats, a release by Lexus said. The LX possesses a number of features that define it as Lexus' flagship SUV. Its recently updated interior and exterior design language balances power and luxury. On the technological front, numerous key passenger comfort features are included as standard, including Lexus Climate Concierge and Easy Access, which automatically adjusts vehicle height during ingress and egress. The LX comes equipped with a 5.7-liter V8 engine that provides high torque at low rpm. Additionally, a new driving mode called Customize Mode―a Lexus first―helps the LX achieve extremely stable and adaptive performance both on and off the road. Furthermore, to further increase safety and peace of mind, the LX is fitted with the Lexus Safety System + package which, as part of a multi-faceted approach to active safety, combines millimeter-wave radar with a camera to achieve high reliability and performance. This is the first time that Lexus Safety System + has been installed in a vehicle sold in Japan. The new LX is priced at 11 million yen (about US$88,000) for the Japanese market. Chief Characteristics of the LX includes "design that balances power and luxury" with the exterior of the vehicle combines the power of an SUV with the inherent luxury befitting a Lexus flagship. The front profile provides a sense of stability with its daringly muscular lower portion, while the side profile emphasizes a refined yet bold and dynamic underbody and the rear cuts a sturdy yet graceful outline. The spindle grille projects a sense of strength and elegance, and symbolizes the ever-evolving nature of Lexus. The lower portion of the grille takes on a protective shape while the inner grille bar juts out energetically from the hood and merges with the grille frame to form a single hard surface. Sequential LED turn signal lamps are utilized in a Lexus vehicle for the first time. These innovative lamps light up in a flowing sequence, increasing visibility when turning right or left. Also available from Lexus for the first time are 21-inch aluminum wheels. The combination of machine-cut highlights and metallic grey, and the addition of a new center ornament, together generate a luxurious feel. The interior is, of course, highly functional, yet it also exudes a high-quality feel through the juxtaposition of such contrasting materials as metal, leather, and wood grain. The horizontally positioned instrument panel enables the driver to easily assess the position and stance of the vehicle, a core requirement for any true SUV. The LX's 5.7-liter V8 engine boasts a wide torque band able to generate approximately 90 percent of its maximum torque at 2,000 rpm. Combined with a Super Intelligent Electronically Controlled Eight-speed Automatic Transmission, the LX demonstrates easy acceleration on-road and ample power at low and medium speeds off-road. Variable Gear Ratio Steering (VGRS) improves handling by adjusting the steering gear ratio according to the speed of the vehicle, thus providing outstanding maneuverability and cruising stability despite the size of the vehicle. Customize Mode has been included for the first time among the drive mode settings on a Lexus. Upon selection of Customize Mode, the powertrain, chassis, and air conditioning controls can each be freely adjusted. This enables the driver to select a driving mode better suited to his or her preferences, thereby improving the driving experience. To complement the Drive Mode Select Switch, the LX comes equipped with 4-Wheel Active Height Control suspension (AHC) and Adaptive Variable Suspension system (AVS), both of which freely control the vehicle's suspension. 4-Wheel AHC automatically controls vehicle height in various situations; for example, when the Lexus-first Easy Access feature is active, vehicle height is lowered when the engine is turned off in order to facilitate ingress and egress. In addition, AVS automatically adjusts the attenuation force of the suspension to suit the prevailing driving conditions, naturally and smoothly controlling the vehicle's vibrations and providing outstanding comfort, maneuverability, and stability. Two features assist driving depending on the prevailing off-road conditions: Crawl Control allows the vehicle to be operated at extremely low speeds through use of the steering wheel alone, without the need to use the accelerator or brake pedals, while the Multi-terrain Select switch increases AWD performance by optimizing traction and brake control. When driving with Crawl Control implemented, turn assist functions are engaged to enhance turning capabilities. This reduces the number of times the steering wheel has to be turned when executing tight turns, thus making the driver's job easier. The LX is also equipped with Multi-terrain Monitors, a system of four cameras that monitor conditions around the vehicle. The system allows the driver to check the road conditions in six blind spot areas around the vehicle, both on and off the road, and facilitates driving on narrow roads or moving over to the road shoulder. In addition, as a Lexus first, the LX features an under-floor view that allows the driver to check both conditions under the vehicle and tire positions while driving off-road. Lexus Safety System + is a package of multi-faceted, active safety technologies. The package includes: Pre-collision System (PCS) with pedestrian detection function; Lane Departure Alert (LDA), a system that alerts the driver if the vehicle is drifting from its lane; Adaptive Hi-beam System (AHS), which selectively blocks sections of high beams that might interfere with the vision of preceding and on-coming vehicles; and Radar Cruise Control (with All-speed Tracking function), a system for use on highways which ensures that a safe distance is maintained from the preceding vehicle. A number of other safety features are also included as standard: Blind Spot Monitor (BSM) is a system that monitors any vehicles to the rear that are difficult to see with the door mirrors, plus an area in adjacent lanes of up to about 60 meters to the rear, and then notifies the driver of any rapidly approaching vehicles; Rear Cross Traffic Alert (RCTA), a system for use when reversing out of car parks that utilizes the BSM radar to detect and notify the driver of vehicles approaching from the rear left or right; Multi-terrain Anti-lock Brake System (ABS), which, in addition to the standard ABS function of preventing wheels from locking up during braking, provides outstanding braking performance even when driving off-road; Electronic Brake force Distribution (EBD); and Brake Assist. The Lexus Climate Concierge advanced climate control system now features the first-of-its-kind3 Climate Concierge Switch, a feature that unifies control of automatic air conditioning, steering-wheel heating, and heating and seat ventilation for driver, passenger, and second row seats. In addition, the system detects whether passengers are present in the passenger and second row seats, and switches the various functions on or off accordingly. The Vehicle Information and Communication System WIDE (VICS WIDE4), equipped on a Lexus for the first time, is a new navigation system that offers increased usability, such as heightened accuracy of traffic information. It takes advantage of the LX's 12.3-inch widescreen display, which can display maps full-screen and provides excellent visibility. The rear-seat entertainment system included as an option features two high-resolution 11.6-inch monitors built into the backs of the front seats. The viewing angle of the displays can be adjusted to provide optimal visibility.